Imaging dents and other imperfections on unpainted body panels has been a hit and miss process. How will the suspect area REALLY look once it's painted? All too often, imperfections and poor repairs get through the production process and into paint where the problem finally becomes obvious. The costly result is that the vehicle winds up in the repair hole to be ground, repaired, and spot painted. We've seen a number of attempts at imaging dents including the use of messy and pricy liquid highlighters, stoning, black spray paint, and hand-feel methods. We realized that there just has to be a better way. Sheet Shine™ Dent Imaging Film. 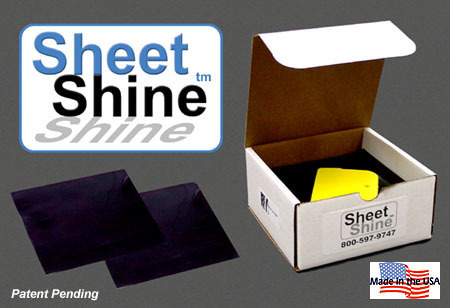 Self-adhesive Sheet Shine™ comes in 6" x 6" sheets. Just remove the liner and apply to a clean dry surface. The adhesive is specially formulated to adhere to body panels and conforms to even the slightest imperfections. The adhesive leaves no residue and has passed "Crater Tests" at major auto assembly plants. Just remove the larger portion of the protective liner to reveal the adhesive side (Fig 1). Leave the 1/4" liner piece in place to create a leader for easy removal. Clean the area on the body panel with an alcohol wipe, then apply Sheet Shine™ (Fig 2). Use the provided squeegee to remove bubbles. You'll see how the area will appear once it is in paint. Sheet Shine™ is super tough, abrasion-resistant, and will not mar or split when many types of dent repair tools are utilized. It can also be used to improve light reflectivity on light-colored painted body panels making it easier to perform Paintless Dent Repair (PDR). and logos are the property of their respective companies. Website development by IQ Learning Systems, Inc.